Help us spread the word about Real Diaper Week and the Great Cloth Diaper Change 2012! Over 5,000 babies were changed into a cloth diaper during last year’s event. With your help we can break the world record and show the world that cloth diapers are Real Simple, Real Diapers! 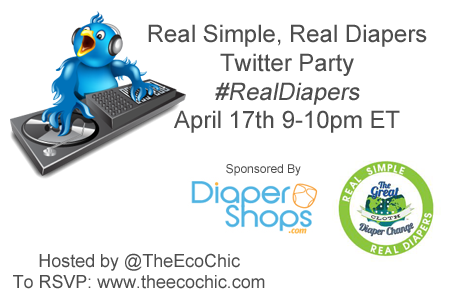 Who to Follow: @TheEcoChic, @DiaperShops, @RealDiapers and panelists. Prizes: We’re giving away $200 worth of gift certificates to Kelly’s Closet! I will try to get to the one in Houston…if not, I’ll be there virtually! Just found out there is one in Wasilla, AK, which I will try to attend! Attractive element of content. I simply stumbled upon your weblog and in accession capital to claim that I acquire actually loved account your blog posts. Any way I’ll be subscribing to your feeds or even I fulfillment you get right of entry to constantly rapidly.